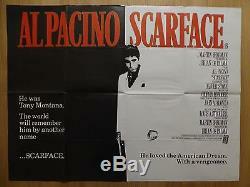 Scarface' (1983) original UK quad poster (40"x30"). This poster has just a very small approx 1cm repaired tear near the top right corner. There is no paperloss though, and overall it is in excellent condition. Originally folded but stored rolled so will be posted rolled. Add me to your Favourites list. The item "SCARFACE (1983) original UK quad film/movie poster, Al Pacino, crime, gangster" is in sale since Monday, February 27, 2017. This item is in the category "DVDs, Films & TV\Film Memorabilia\Posters\Originals - UK Quads\1980s".